Five London gigs have been announced in which acts that long ago departed the toilet circuit for big tops and banquet halls will return to their roots. These acts have come together with the charity War Child (and O2) to help raise money for children affected by horrible conflicts across the world, putting on a series of February shows in small venues that should prove both informative and exhilarating, under the banner Passport Back to the Bars. Who are we talking about here? The Vaccines kick things off at Camden's Dublin Castle on 16 February, before Ride play what amounts to the start of their serious comeback at the 100 Club on 19 February. That same night Duran Duran will be playing Wilton's Music Hall, and on 22 February it's the turn of You Me At Six at Hoxton Bar & Kitchen. 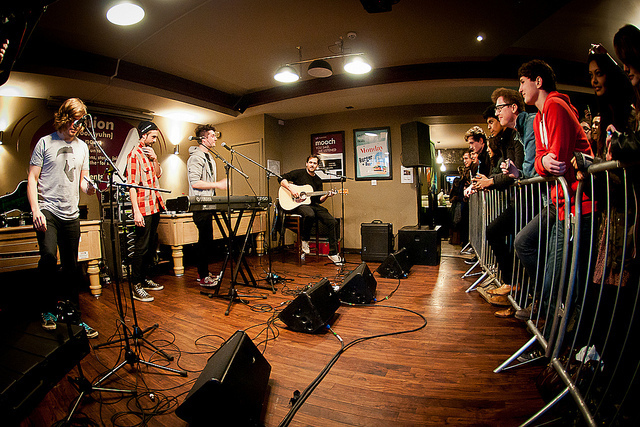 The London events are rounded off on 23 February by Bastille, at Sofar Sounds in Shoreditch. It's safe to say these acts will not be playing venues this intimate again any time soon. Elbow have decided their tiny gig will be in Manchester, which is bang out of order, but that still leaves us with five gigs to cross our fingers about as the names start emerging from the hat. How do you get your hands on tickets? Not for War Child the horrifying spectacle of a 9am scramble on websites that fall over seconds later with all tickets flogged to secondary outlets. There will be a ballot for each show, the catch being you have to donate £4.50 to War Child for every ballot entry. Entry closes at midnight on Sunday 8 February for all five shows. War Child are, in essence, 29 people trying to change the world for the better from an office in north London, and occasionally they need a little help. 'The smallest gigs to make the biggest difference' goes the tag line. The least we can do for the chance to see a quality show in a small venue is stump up less than a fiver for a good cause. War Child's Passport Back to the Bars takes place between 16 and 23 February across five London venues. All tickets will be allocated via a paid ballot (£4.50 per entry), which can be found at the Passport Back to the Bars website.